This programme also runs full-time by day, this page refers to the part-time delivery by night. 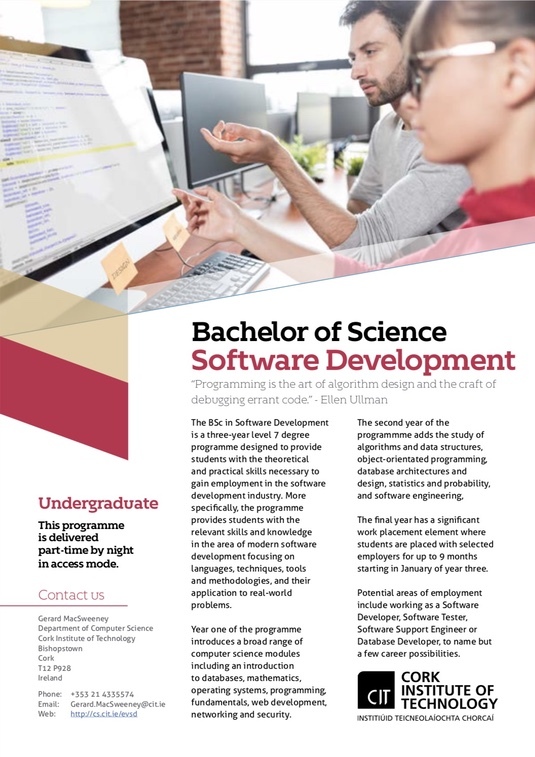 The BSc in Software Development is a level 7 degree programme designed to provide students with the theoretical and practical skills necessary to gain employment in the software development industry. More specifically, the programme provides students with the relevant skills and knowledge in the area of modern software development focusing on languages, techniques, tools and methodologies, and their application to real-world problems. This programme is designed and intended for graduates of the Higher Certificate in Software Development. As this degree programme is delivered on campus by night, students must first successfully complete the Higher Certificate in Software Development or equivalent before applying for entry to this programme. Non standard applications will be considered on a case by case basis, please see the RPL page for more information. The first semester of the programme has four taught modules and a group project. The second semester has a 30 credit work placement element where students are placed with selected employers for up to 9 months starting in January. A module based work placement alternative is also available. Click this link or the image above to download a flyer which contains links to the complete list of modules. Please click here or the programme schedule button for full module details. The programme has a significant work placement element where students are placed with selected employers for up to 9 months starting in January of year three. This is normally a paid placement where you will gain significant on the job experience. A module based work placement alternative is also available. Graduates of this programme have the opportunity to progress to 4th year of the full-time BSc (Honours) in Software Development programme.